We introduce our selves as professionals who are qualified in Kitchen Work-Flow & Facility Planning having an extensive experience and exposure in designing the Kitchen & Laundry Equipment layout & Services with cost effective Operational system. We can provide Kitchen Facility Planning for Hotels and Resorts, Restaurants, Hospitals & Diet Kitchens, Military Mess & Clubs, Institutions like International Schools, Technical College, University-Hostels, and Cafeterias and some special Kitchens for Villas. 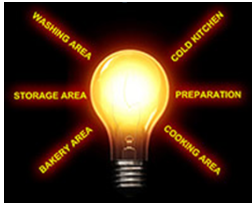 We offer the following services as our scope of work and supervise them at site progress. On approval of Schematic layout, we will provide the detailed Equipment Layout plan. We will also provide the BOQ with all the details of the equipment within the layout with its Size and Capacity etc. On approval of the Equipment Layout Plan we will provided our client with the detailed service list indicating Electrical, Gas, Water (Hot & Cold) and Drain points according to the requirement of each and every individual Equipment on the plan along with the heights and specification of each point. We work closely with owners, architects, engineers, construction managers, and general contractors to be sure that all aspects of a project are coordinated together. We would appreciate the opportunity to work with you, whether your project is a small renovation or a large new facility. With our attention to detail; we make sure that our customer gets what they want and moreover what they actually need.